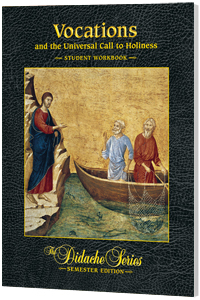 This Student Workbook is an accompaniment to Vocations and the Universal Call to Holiness; it allows the student to understand how to prayerfully discern the will of God in his or her own life through compelling and meaningful exercises. Using combinations of multiple choice, fill in the blank, and short answer questions, the students recall and apply concepts from the textbook to their own lives. This Student Workbook has perforated pages so students may turn in their work. It also includes a collection of common Catholic prayers and devotions. The Didache Semester Series is a series of high school textbooks, teacher's manuals, and student workbooks published by Midwest Theological Forum. Each title spans one academic semester. These titles have been developed according to the 2007 curriculum framework from the USCCB Subcommittee on the Catechism to assist in the publication of religious education textbooks for Catholic high schools.